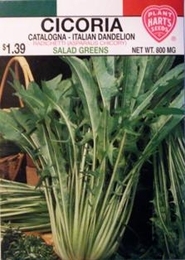 This is the true Italian Dandelion. The slender leaves are very tender when young and make delicious greens. Mix with other greens to make a tasty Mesclun salad. The tops may be cut several times during the season. Use fresh out of the garden in salads or cook like spinach. Bulk Cicoria Catalogna seed available. 18,000 Seeds/oz. Plant 1/8oz per 100ft row. 10-16 oz of Cicoria Catalogna seed needed per acre.